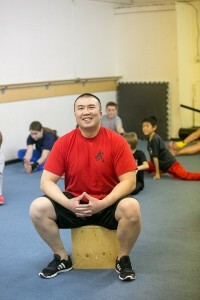 Born in Prince Albert and raised in Saskatoon, Haven Seto founded the Chinese Martial Arts Academy in 2000, forming it out of a small group of friends interested in learning wushu. However, the school soon expanded beyond Haven’s small clique, and grew to a formal training program for individuals ages three and older. Haven relishes his mentorship role with the CMAA and the positive influence Chinese martial arts can have on his students. He intimately understands the ways that wushu improves physical and mental health, provides individuals with essential self-defense skills, brings families together, and spreads positive cultural practices. While Haven is accomplished as a competitive athlete on the international level, he focuses on developing as a coach and mentor, hoping to bring out the best in every student that comes through his door. He is constantly inspired by his own influences, Master Ronnie Yee, Master Shane Kachur, and Coach Skipper “Saigon” Kelp, hoping to impart their wisdom onto the local wushu community. Outside of wushu, Haven works as the Employment Manager/ Mentorship Program Coordinator at the Saskatchewan Intercultural Association and cherishes every moment he gets to spend with his loving wife and daughter.